Annually, a growing investment management corporation had a high volume of recurring hiring needs at a number of locations across the United States. As the business grew, the demand for Processing Associates, Investment Associates, and Client Relationship Specialists grew with them. However, the client’s internal recruiting staff was in danger of missing the previous year’s target hire numbers due to the number and quality of this year’s candidate pool. They wanted to ramp up recruiting to hit those targets, but do so without adding headcount. 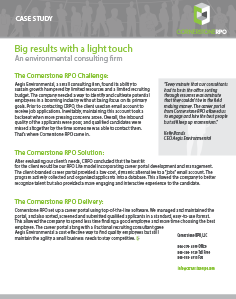 After understanding the client’s needs, Cornerstone RPO suggested an augmentation approach, where a team of recruiting consultants would be put in place to work hand-in-hand with the client’s internal recruiting group to bridge the gap. In less than a month, Cornerstone RPO established a support team of up to 8 consultants to work virtually with the client. The team’s responsibilities spanned candidate sourcing and pipeline generation to candidate screening and engagement, as well as assisting in interview scheduling and other candidate preparation. 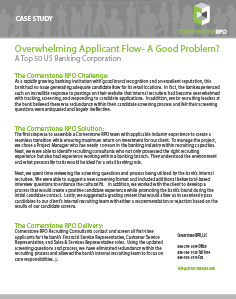 Cornerstone RPO’s consultants used a variety of methods to identify and contact qualified candidates. In addition, while working with the client’s internal management, the team identified a way to expand the client’s candidate base by establishing other equivalent sources of appropriate hires beyond where the client had typically looked in the past. In just over a year of partnership, Cornerstone RPO’s recruitment team played a major role in the client’s hiring of over 1500 new staff. 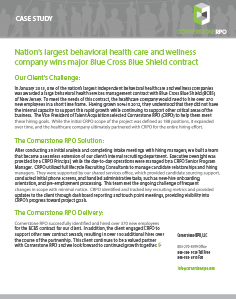 In January 2013, one of the nation’s largest independent behavioral healthcare and wellness companies was awarded a large behavioral health services management contract with Blue Cross Blue Shield (BCBS) of New Jersey. To meet the needs of this contract, the healthcare company would need to hire over 370 new employees in a short time frame. Having grown 50% in 2012, they understood that they did not have the internal capacity to support this rapid growth while continuing to support other critical areas of the business. 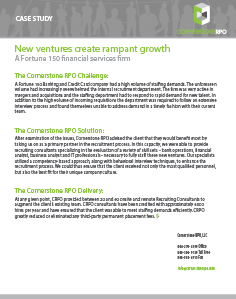 The Vice President of Talent Acquisition selected Cornerstone RPO (CRPO) to help them meet these hiring goals. While the initial CRPO scope of the project was defined as 188 positions, it expanded over time, and the healthcare company ultimately partnered with CRPO for the entire hiring effort. After conducting an initial analysis and completing intake meetings with hiring managers, we built a team that became a seamless extension of our client’s internal recruiting department. Executive oversight was provided by a CRPO Principal, while the day-to-day operations were managed by a CRPO Senior Program Manager. CRPO utilized full lifecycle Recruiting Consultants to manage candidate relationships and hiring managers. They were supported by our shared services office, which provided candidate sourcing support, conducted initial phone screens, and handled administrative tasks, such as new-hire onboarding, orientation, and pre-employment processing. This team met the ongoing challenge of frequent changes in scope with minimal notice. CRPO identified and tracked key recruiting metrics and provided updates to the client through dashboard reporting and touch point meetings, providing visibility into CRPO’s progress toward project goals. Cornerstone RPO successfully identified and hired over 370 new employees for the BCBS contract for our client. In addition, the client engaged CRPO to support other new contract awards, resulting in over 150 additional hires over the course of the partnership. 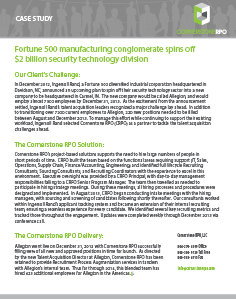 This client continues to be a valued partner with Cornerstone RPO and we look forward to continued growth together. A Fortune 150 Banking and Credit Card company had a high volume of staffing demands. The unforeseen volume had increasingly overwhelmed the internal recruitment department. The firm was very active in mergers and acquisitions and the staffing department had to respond to rapid demand for new talent. In addition to the high volume of incoming requisitions the department was required to follow an extensive interview process and found themselves unable to address demand in a timely fashion with their current team. After examination of the issues, Cornerstone RPO advised the client that they would benefit most by taking us on as a primary partner in the recruitment process. In this capacity, we were able to provide recruiting consultants specializing in the evaluation of a variety of skill sets – bank operations, financial analyst, business analyst and IT professionals– necessary to fully staff these new ventures. Our specialists utilized a competency-based approach, along with behavioral interview techniques, to enhance the recruitment process. We could thus ensure that the client received not only the most qualified personnel, but also the best fit for their unique company culture. At any given point, CRPO provided between 20 and 60 onsite and remote Recruiting Consultants to augment the client’s existing team. CRPO consultants have been credited with approximately 6000 hires per year and have ensured that the client was able to meet staffing demands efficiently. CRPO greatly reduced or eliminated any third-party permanent placement fees. The European based client made the decision to relocate their North American headquarters from Augusta, GA to Charlotte, NC. The case seemed fairly straight forward – a few hundred new employees at a new location – but as we learned about their situation it became apparent that we could help in a variety of ways. The client had no standing recruitment department and conducted all recruiting through third-party search firms. This ad hoc system was cost prohibitive and complicated. CRPO identified an opportunity to make this client stronger and more self-sufficient. 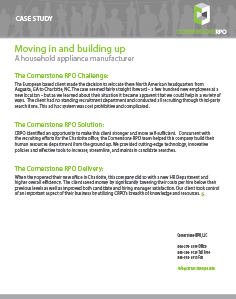 Concurrent with the recruiting efforts for the Charlotte office, the Cornerstone RPO team helped this company build their human resources department from the ground up. We provided cutting-edge technology, innovative policies and effective tools to increase, streamline, and maintain candidate searches. When they opened their new office in Charlotte, this company did so with a new HR Department and higher overall efficiency. The client saved money by significantly lowering their costs per hire below their previous levels as well as improved both candidate and hiring manager satisfaction. Our client took control of an important aspect of their business by utilizing CRPO’s breadth of knowledge and resources. A five-star resort approached us with a singular problem. Due to their remote location, the candidate pool for 600 summer seasonal positions and 200 additional non-seasonal positions was very low. So low that it was becoming difficult to fill and adversely affecting the resort. Management at this resort had no other options but to use existing employees to try and fill the gaps. The end result was a massive expenditure in overtime and overworked employees. We knew from experience that these were great hoteliers but they needed our help in recruitment. 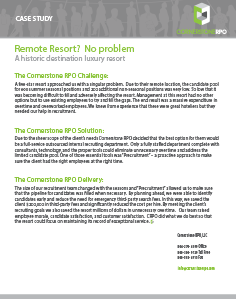 Due to the sheer scope of the client’s needs Cornerstone RPO decided that the best option for them would be a full-service outsourced internal recruiting department. Only a fully staffed department complete with consultants, technology, and the proper tools could eliminate unnecessary overtime and address the limited candidate pool. One of those essential tools was “Precruitment” – a proactive approach to make sure the client had the right employees at the right time. The size of our recruitment team changed with the seasons and “Precruitment” allowed us to make sure that the pipeline for candidates was filled when necessary. By planning ahead, we were able to identify candidates early and reduce the need for emergency third-party search fees. In this way, we saved the client $200,000 in third-party fees and significantly reduced the cost per hire. By meeting the client’s recruiting goals we also saved the resort millions of dollars in unnecessary overtime. Our team raised employee morale, candidate satisfaction, and customer satisfaction. CRPO did what we do best so that the resort could focus on maintaining its record of exceptional service. In December 2012, a Fortune 500 diversified industrial corporation headquartered in Davidson, NC, announced an upcoming plan to spin off their security technology sector into a new company to be headquartered in Carmel, IN. The new company would employ almost 7500 employees by December 31, 2013. As the excitement from the announcement settled, our client’s talent acquisition leaders recognized a major challenge lay ahead. In addition to transitioning over 7200 current employees to the new company, 220 new positions needed to be filled between August and December 2013. To manage this effort while continuing to support their existing workload, our client selected Cornerstone RPO (CRPO) as a partner to tackle the talent acquisition challenges ahead. 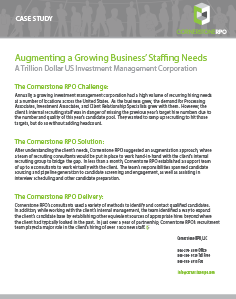 Cornerstone RPO’s project-based solutions supports the need to hire large numbers of people in short periods of time. CRPO built the team based on the functional areas requiring support (IT, Sales, Operations, Supply Chain, Finance/Accounting, Engineering) and identified full lifecycle Recruiting Consultants, Sourcing Consultants, and Recruiting Coordinators with the experience to excel in this environment. Executive oversight was provided by a CRPO Principal, with day-to-day management responsibilities falling to a CRPO Senior Program Manager. The team then travelled as needed to participate in hiring strategy meetings. During these meetings, all hiring processes and procedures were designed and implemented. In August 2013, CRPO began conducting intake meetings with the hiring managers, with sourcing and screening of candidates following shortly thereafter. Our consultants worked within our client’s applicant tracking system and became an extension of their internal recruiting team, ensuring a seamless experience for every candidate. We identified several key recruiting metrics and tracked those throughout the engagement. Updates were completed weekly through December 2013 via conference call. The new company went live on December 31, 2013 with Cornerstone RPO successfully filling 98% of all new and approved positions in time for launch. As directed by the new Talent Acquisition Director, Cornerstone RPO has been retained to provide Recruitment Process Augmentation services in tandem with their internal team. Thus far through 2014, this blended team has hired 423 additional employees for our client in the Americas. 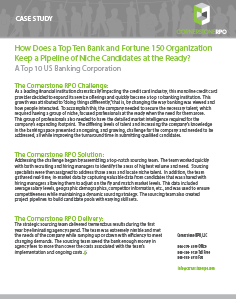 How Does a Top Ten Bank and Fortune 150 Organization Keep a Pipeline of Niche Candidates at the Ready? As a leading financial institution dramatically impacting the credit card industry, this monoline credit card provider decided to expand its service offerings and quickly became a top 10 banking institution. This growth was attributed to “doing things differently,” that is, by changing the way banking was viewed and how people interacted. To accomplish this, the company needed to secure the necessary talent, which required having a group of niche, focused professionals at the ready when the need for them arose. This group of professionals also needed to have the detailed market intelligence required for the company’s expanding footprint. The differing levels of talent and increasing the company’s knowledge in the banking space presented an ongoing, and growing, challenge for the company and needed to be addressed, all while improving the turnaround time in submitting qualified candidates. Addressing the challenge began by assembling a top-notch sourcing team. The team worked quickly with both recruiting and hiring managers to identify the areas of highest volume and need. Sourcing specialists were then assigned to address those areas and locate niche talent. In addition, the team gathered real-time, in-market data by capturing valuable data from candidates that was shared with hiring managers allowing them to adjust on the fly and match market levels. This data included average salary levels, geographic demographics, competitor information, etc., and was used to ensure competitiveness while maintaining a dynamic sourcing strategy. The sourcing team also created project pipelines to build candidate pools with varying skill sets. The strategic sourcing team delivered tremendous results during the first year by eliminating agency spend. The team was extremely nimble and met the needs of the company while ramping up or down with efficiency to meet changing demands. The sourcing team saved the bank enough money in agency fees to more than cover the costs associated with the team’s implementation and ongoing costs. Overwhelming Applicant Flow- A Good Problem? As a rapidly growing banking institution with good brand recognition and an excellent reputation, this bank had no issue generating adequate candidate flow for its retail locations. In fact, the bank experienced such an incredible response to postings on their website that internal recruiters had become overwhelmed with tracking, screening, and responding to candidate applications. In addition, senior recruiting leaders at the bank believed there was redundancy within their candidate screening process and felt their screening questions were antiquated and largely ineffective. The first step was to assemble a Cornerstone RPO team with applicable industry experience to create a seamless transition while ensuring maximum return on investment for our client. To manage the project, we chose a Project Manager who has nearly 10 years in the banking industry within recruiting capacities. Next, we were able to identify recruiting consultants who not only possessed the right recruiting experience but also had experience working within a banking branch. They understood the environment and what personality traits would be ideal for a retail banking role. Next, we spent time reviewing the screening questions and process being utilized by the bank’s internal recruiters. We were able to suggest a new screening format and included additional behavioral-based interview questions to enhance the cultural fit. In addition, we worked with the client to develop a process that would create a positive candidate experience while promoting the bank’s brand during the initial candidate contact. Lastly, we suggested a grading system that would allow us to seamlessly pass candidates to our client’s internal recruiting team with either a recommendation or rejection based on the results of our candidate screens. Cornerstone RPO Recruiting Consultants contact and screen all first-time applicants for the bank’s Financial Service Representative, Customer Service Representative, and Sales & Services Representative roles. Using the updated screening questions and process, we have eliminated redundancy within the recruiting process and allowed the bank’s internal recruiting team to focus on core responsibilities. This small environmental consulting firm, found its ability to sustain growth hampered by limited resources and a limited recruiting budget. The company needed a way to identify and cultivate potential employees in a booming industry without losing focus on its primary goals. Prior to contacting CRPO, the client used an email account to receive job applications. Inevitably, maintaining this account took a backseat when more pressing concerns arose. Overall, the inbound quality of the applicants were poor, and qualified candidates were missed altogether by the time someone was able to contact them. That’s where Cornerstone RPO came in. After evaluating our client’s needs, CRPO concluded that the best fit for the client would be our RPO Lite model incorporating career portal development and management. The client-branded career portal provided a low-cost, dynamic alternative to a “jobs” email account. The program actively collected and organized applicants into a database. This allowed the company to better recognize talent but also provided a more engaging and interactive experience to the candidate. Cornerstone RPO set up a career portal using top-of-the-line software. We managed and maintained the portal, and also sorted, screened and submitted qualified applicants in a standard, easy-to-use format. This allowed the company to spend less time finding a good employee and more time choosing the best employee. The career portal along with a fractional recruiting consultant gave this environmental consulting firm a cost-effective way to find quality employees but still maintain the agility a small business needs to stay competitive. When a managed care provider won a contract for business in a new state, they found themselves in need of a significant new employee pool in a short timeframe. Within 120 days, the company needed to prove their ability to hire 150 employees at the new location. While it may have seemed like a daunting challenge to the client, we knew it was right up our alley. 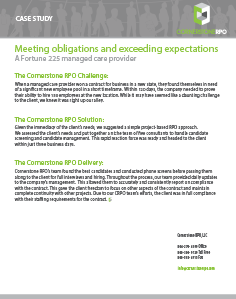 Given the immediacy of the client’s needs, we suggested a simple project-based RPO approach. We assessed the client’s needs and put together a niche team of five consultants to handle candidate screening and candidate management. This rapid reaction force was ready and headed to the client within just three business days. Cornerstone RPO’s team found the best candidates and conducted phone screens before passing them along to the client for full interviews and hiring. Throughout the process, our team provided daily updates to the company’s management. This allowed them to accurately and consistently report on compliance with the contract. This gave the client freedom to focus on other aspects of the contract and maintain complete continuity with other projects. Due to our CRPO team’s efforts, the client was in full compliance with their staffing requirements for the contract.